Top: View of Sterling Ridge looking north from Mt. Mansfield. Middle: Sterling Section volunteers head out to put up (with each other and) a slew of new trail signs! 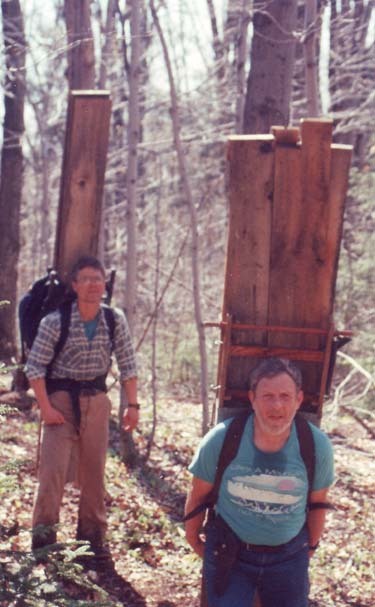 Bottom: Carrying lumber to build Bear Hollow Shelter. The Sterling Ridge is the line of mountains stretching north from Smugglers Notch - running through Spruce Peak, Madonna Peak, Morse Mountain, and Whiteface Mountain, then descending again to the valley of the Lamoille River. The Sterling Section of the Long Trail officially starts at Chilcoot Pass, which is the low point between Madonna and Morse, about six miles north of Smugglers Notch. Chilcoot Pass also marks the end of the ski resorts and other development that fill much of Stowe and Smugglers Notch. 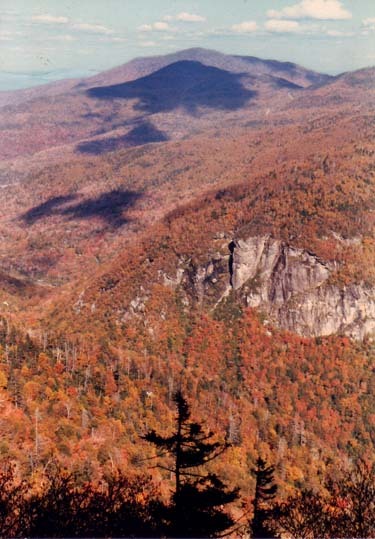 From the Pass north for many miles is a remote area of Vermont State Forest managed for primitive recreation and natural resource protection. All in all, the Sterling Section maintains 13.1 miles of hiking trails and three camp sites from Chilcoot Pass north to the Lamoille River. These form just a part of the Long Trail System - a connected network of over 450 miles of hiking trails and over 75 campsites that stretch along the entire Green Mountain chain from Massachusetts to Canada, the length of Vermont. You can easily shoulder your pack and head out on the trail without looking back for an afternoon, a weekend, or an entire summer. The trail system was conceived by the Green Mountain Club in 1910, and has been an ongoing labor of love ever since. In recent decades, the number of visitors to Vermont's backcountry places has soared. The need for trails and campsites is greater than ever. When carefully built they allow more people to have a primitive experience of the mountains while "leaving no trace" of their visit, so that the next visitor who follows can have the same experience again. Because this work is done by hand, in the backcountry, it adds up to a lot of person hours of labor. There will never be enough money to just pay people out right to do all this work. Our trail system exists only because of many years of volunteer effort - that's why we call the Sterling Section "our section" - and why we invite you to come on out and go for a hike! The trails in the Sterling Section pass through a working landscape on a "patch work quilt" of public and privately owned land. Yes, some parts of the Section are remote, backcountry places with a wild feeling. But these are only a part of the full spectrum of traditional rural Vermont. 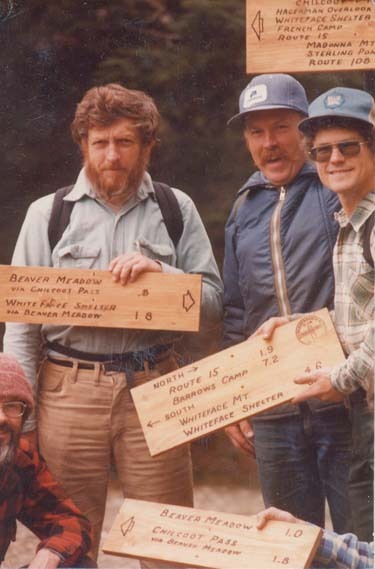 Hikers will also see evidence of logging and active forest management, will walk down quiet country roads past homes, will follow an old railroad bed maintained as a trail by snowmobile clubs, and cross farmers' hay fields. Please respect the private property of individuals who have long allowed the trail to cross their land; just as you also respect the public lands we all share in trust. The best times to go hiking on the Long Trail are summer and fall. In the summer the Green Mountains live up to their name with exuberance. It's almost hard to imagine the lush forests, carpeted with ferns and mosses, will return to the whiteness of winter in only a few months. And Vermont's Fall foliage season with riots of colorful leaves is, of course, world famous. Winter is a fine time to be outside in the Vermont mountains, and Beaver Meadow is especially popular in the winter. However, it is a potentially dangerous time that requires skills and planning. (The GMC offers education workshops in winter camping.) And be aware that the Long Trail is not maintained for winter use. Painted blazes, especially white ones, are hard to see in the winter. And the narrow, minimally cleared path of a summer hiking trail is quickly obscured by a thick layer of snow. Finally, Spring is a bad time to hike on the Long Trail System. This seems odd to people from elsewhere in the country who think of spring as a wonderful time full of flowers. However, in Vermont spring is better known as "mud and bug season." In fact, high elevation trails on state land, such as the Long Trail on the Sterling Ridge, are officially closed to the public until Memorial Day weekend each year so that the muddy trails may dry out before receiving heavy hiker traffic.